Embark & Return Miami, Florida. Visiting Roatan, Bay Island, Honduras; Harvest Caye, Belize; Costa Maya, Mexico; Cozumel, Mexico; with 2-days at sea. Amenities:A full-size bed, a one-way window to the corridor, a separate area for bathroom, sink and shower, 26" flat-screen TV, and safe. Studio guests have private keycard access to the Studio complex and exclusive Studio Lounge. Please Note: Smoking is prohibited in all staterooms. Occupancy: 2 guests standard - some sleep 3 or 4. Door opens to center interior corridor. Amenities: Two lower beds that can be converted to a queen-size bed, bathroom with shower, 26" flat-screen TV, mini-bar, full-size closet and a safe. Located mid-ship, you will have easy access to everything. These staterooms feature a large picture window and two single beds that convert to a queen-size bed. Accommodates: 2 Total Approx. Size: 160 - 245 sq. ft. Enjoy a large picture window with amazing forward facing views and two single beds that convert to a queen. Accommodates: 2 Total Approx. Size: 197 sq. ft. Enjoy easy access to all the outdoor fun on the top decks. Your stateroom includes two lower beds that convert to a queen-size bed and some feature additional bedding for up to 2 guests. Accommodates: 2-4 Total Approx. Size: 207 sq. ft. Balcony Size: 32 sq. ft. Located mid-ship with easy access to everything, these Mini-Suites feature two lower beds that convert to a queen-size bed, sofa bed, some feature additional bedding for 1, and a private balcony. Accommodates: 2 - 4 Total Approx. Size: 249 sq. ft. Balcony Size: 42 sq. ft. These Penthouses are located in The Haven and include a king-size bed and single sofabed, plus a private balcony with a fantastic view. Accommodates: 6 Total Approx. Size: 324 - 620 sq. ft. Balcony Size: 54 - 138 sq. ft. Perfect for the family, these Villas are located in The Haven and feature two bedrooms, one with a king-size bed, the other with a double sofa bed, plus additional bedding and two bathrooms. Accommodates: 6 Total Approx. Size: 538 - 622 sq. ft. Balcony Size: 43 - 127 sq. ft. Port charges, taxes and fees: are $407.34 per person additional based on double occupancy and Single taxes are Higher. Pricing is subject to change without notice. All Fees, taxes, and any surcharges imposed by the cruise line are subject to change without notice. Charges vary for single, triples, and quads. Ask for details. ** Rates not held in allotment and pricing subject to change and separate deposit/cancellation policy. Complete cancellation policies and optional travel insurance will be offered at time of booking. Deposit: $500 per cabin due at the time of booking. (Suites require a higher deposit). Port charges, taxes and Non-commissionable fees are: $403 per person additional Deposit: $250pp at time of booking. Suites require additional deposits and are non-refundable. Final payment is due 120 days prior to sailing. Haven suites require large deposits and have stricter cancellation policies. 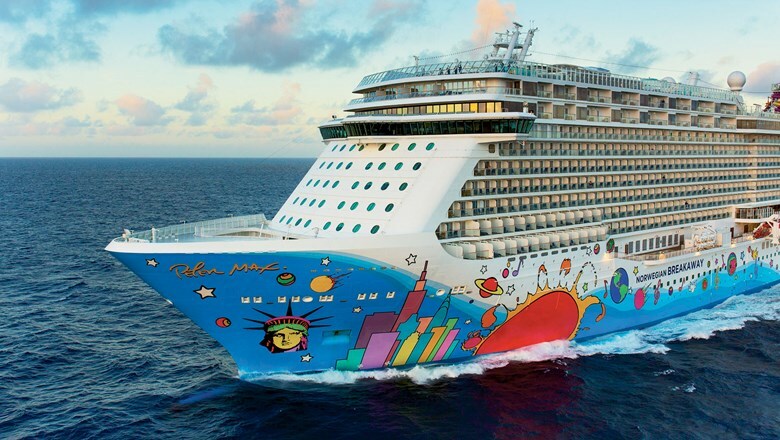 •	After deposit $50 per person penalty plus, any non-refundable deposits assessed by NCL.